A 14-year-old boy from the village of Haris, near Ari’el settlement in the West Bank, is arrested by Israeli soldiers, painfully tied and blindfolded. He is transferred to Megiddo prison inside Israel, in violation of article 76 of the Fourth Geneva Convention. Fourteen-year-old H.S. lives in Haris village, close to Ari’el settlement and a highway used by Israeli soldiers and settlers. “At around noon on Thursday, 14 March, I was with two of my cousins picking peas for my mother in a field close to my house,” says H.S. “Two army jeeps drove by and a soldier asked us what we were doing. They didn’t believe we were picking peas and told us to stand by the side of the road. I was scared.” H.S. was then tied with a single plastic hand-tie and blindfolded. Hadi’s older brother was also detained by the soldiers. The boys were then placed in the back of military vehicles and driven off. H.S. and the other boys were taken to a military base near the town of Qalqiliya, in the West Bank. On arrival he was placed in a room by himself and his feet were also tied. “At around 1:00 a.m. a soldier came and brought me some food. He took off the blindfold and cut the hand tie but kept my legs tied. When I finished eating he blind folded me and tied my hands again with one plastic tie but this time it was tighter. 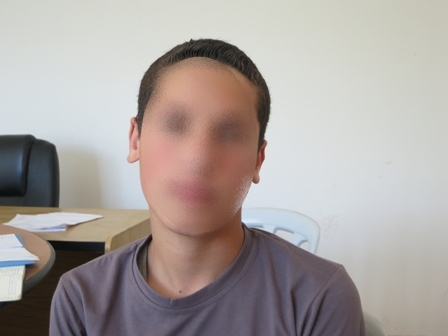 It cut into my wrists and was very painful.” The boys were then driven to Ari’el settlement. “On the way the soldiers swore at us,” recalls H.S. On arrival at Ari’el the boys were fingerprinted and photographed. Later that day, H.S. was taken a short distance to Salem military court where he saw his lawyer for the first time. The proceedings were adjourned until Wednesday, 20 March. Hadi was then taken back to Megiddo prison, inside Israel. On 20 March, Hadi was brought back to Salem military court and released on bail of NIS 1,000. He is due back in court on 30 July. “When we got home I was happy to see my uncles and grandparents waiting for me, but I cried when I saw my mother. I also missed my school exams,” says H.S.